Across the state, 30 people were arrested, 15 by Aurangabad (city) police and 13 by Pune (rural) cops, and 1,278 people detained under the Maharashtra (Bombay) Police Act. 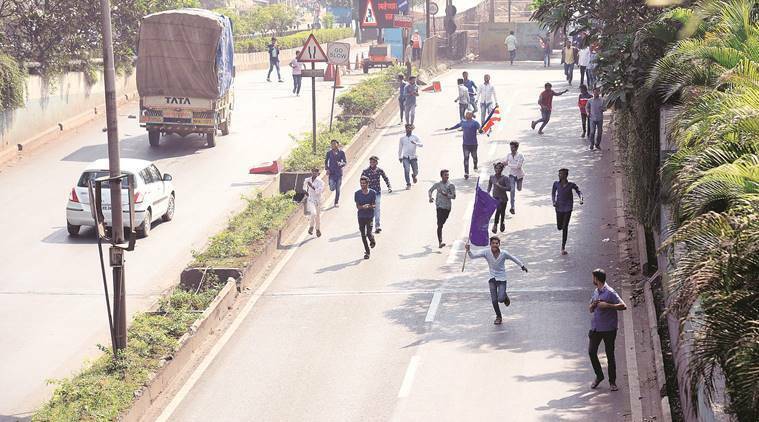 A teen boy died in Maharashtra’s Nanded district, several people, including police personnel, were injured, and 102 cases registered across the state on Wednesday as normal life in Mumbai, Pune and several areas was disrupted by a near-complete shutdown during a state-wide bandh called by Dalit groups. According to information collated from across the state late evening, nine policemen sustained minor injuries while controlling protesters in different areas of Mumbai. Two officers and eight constable were injured after more than 3,000 protesters gathered near Cidco police station in Aurangabad. The police fired 10 rounds of pellets and 18 tear gas shells to disperse the crowd. In Latur, five policemen sustained minor injuries in stone-throwing by protesters. In another incident, the office of BJP MLA Nanabahu Ghule was vandalised at Chandrapur. While 13 cases were registered in Pune, 11 cases were registered in Thane, and six each in Akola and Auranganad (city). Outside the police station, Kshirsagar issued a call for a bandh in Kolhapur on Thursday as a mark of protest by “Hindu organisations” against the Dalit protesters. In Mumbai, suburban local train services were hit repeatedly on all three lines, road traffic stalled at key junctions and shops and establishments were closed through the day in large parts of the suburbs. From early Wednesday, Mumbai police personnel, including riot control personnel, were deployed in sensitive locations, and near most railway stations. Despite police presence, train services suffered repeatedly by rail rokos at various stations. In the afternoon, protesters blocked the tracks at Dadar, in central Mumbai. The newly introduced AC local was also suspended after it managed to only reach Vasai from Virar. GRP commissioner Niket Kaushik said, “While the harbour line and western railway had intermittent problems, the central line was impacted in a big way.” All four main highways through the financial capital were blocked by protesters. Several schools remained closed in Mumbai and suburbs. Examinations conducted by Mumbai University were affected. In Pune, the bandh saw a lukewarm response in the morning, but the shutdown was well and truly under way by noon and most commercial establishments downed shutters. Stones were thrown at buses, and Pune Mahanagar Pariwahan Mahamandal Ltd said at least 55 buses were damaged, leading to suspension of services until evening.